MagentaDot Brands’ logo makeover service can help with the makeover of old brands that are in need strengthening for website and high resolution printing use. This logo design makeover and the Atujara MCC logo makeover are new versions of fundamentally sound original concepts. In the transition from technical pens and paste-up to digital design the complex physics of ink on paper has remained unchanged, in addition the requirements for reproducing thumbnail-sized brands on screen portals as small as smartphones has changed the nature of logo design, logos must be bold. Most makeovers are a case of scan the original “throw away and start afresh”. Though they are made with the best intentions, designs from the 1970s can miss the mark in terms of requirements for the web. Sometimes the problem is poor craftsmanship. More often the problem is with “effectiveness” or “style” or poor craftsmanship, which are ways of saying that the legacy Auto Restorations was some of both. It did not accurately or fully correctly express the business. If I had done the expedient thing and just scanned the old letterhead then neither the fonts or the black linework would reproduce to a decent standard on the website or in print. Redraw the overlays of two iconic vehicles, one over the other, and over the “AUTO” type as vector drawings. I referred back to photo reference of the actual classic cars to get the details right on the blue Bugatti race car such as the louvreing, the wheels and exterior handbrake. Overlays add complexity and can easily obscure rather than clarify if not handled with care. Auto Restorations’ original 1973 letterhead. As the enlargement shows the logo has problems. The line work is spidery and roughly drawn, the blue does not align with the black. The result: a vague dissonance. Your eye bounces up and down, there is no clear starting point, and the too open letter spacing of AUTO adds to an overall effect that feels poorly resolved and incomplete—not qualities that the company wants to convey on their new website. I tested and improve the car icons in an iterative process, I reduced the first iteration of the redrawn artwork to screen size, pasted into Photoshop for critical review. 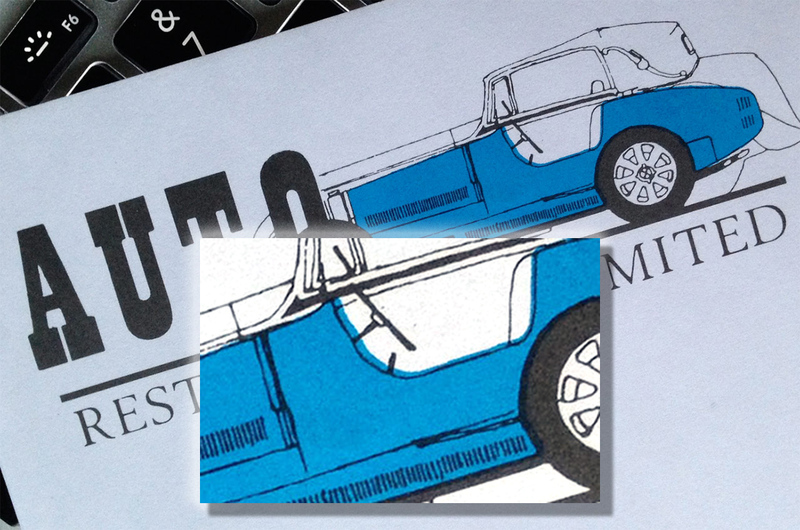 Simplified the cars’ vector drawing details, strengthened the line weights for use at thumbnail screen size. Typographic design: Selected a clean sans-serif typeface of the correct time period for the vehicles and well suited to screen and print, Futura. Following the spirit of the original design set the type overlaid by the car icons, then reversed ‘Restorations’ out of a black panel to give the cars a solid platform of tarmac to stand on. Carefully de-cluttered the overlaying and separation of the two cars and AUTO type for clear readability against both white and black backgrounds. 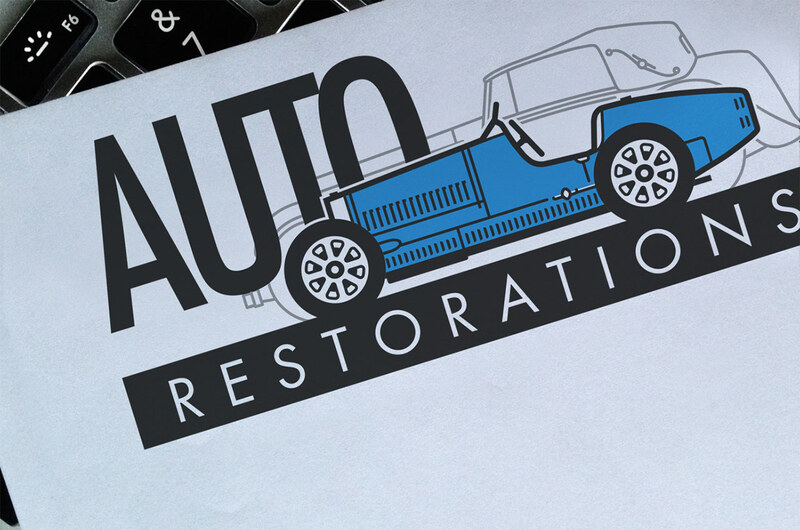 The Auto Restorations’ logo makeover achieves what you want in a logo, to pull the reader in towards the centre. Logo repair jobs range from simple to intricate, I need to see what the raw materials are that I will have to work with. The better the quality of the of the original source file the easier the redrawing, clean-up and repair process and the faster your design will be restored better than new. Contact me here. Logo repair, what does it cost? The level of service scales with the complexity of the job and the quality of the source material you supply, how quickly you require it to be done and the range of final file formats you need. All our logo repair projects will provide you with the clean web and print ready files that you need to put your restored logo to use. For relatively complex logos & good quality reference material. For very complex logos or low grade source material. Delivery negotiated. Consultation required in the initial stages. Essential set of print & web files. Professional set of print & web files. Professional set of print & web files. Auto Restorations’ original 1973 letterhead. As the enlargement shows the logo has problems. The Auto Restorations’ logo makeoverr achieves what you want in a logo, to pull the reader in towards the centre. Bugatti t49, photo of Auto Restorations Classic car restoration, a side elevation clear cut on a white background as mixed digital illustration and photocomposite. Spread from Classic Car enthusiasts magazine, showing ‘page dominance’ achieved by the design of Auto Restorations’ 2010 advertising campaign.